Feng shui is assumed to be thousands of years old. Masters as Lam Kam Chen suggest its appearance around 3000 BC and other recent findings place it in an even older order. It is obvous that a science that comes from so remote in time has evolved to our times in many ways, adapting to the passage of centuries to the needs and lifestyles of different generations. In all texts there is referance to two main branches, on the one hand the Form School to which is attributed more years of experience and on the othe side the Compass School. During a long time there have existed struggles and disputes about the supremacy of each school, although today, any renowned master bases his art on the utilization of the best principles of each. This may be a simple summary that approaches us to the contemparey practices of feng shui. As its name suggests it is based on the detailed observation of the existing forms, both on a geographical level and man-made, so the plateaus, mountains, rivers, buildings, vegetation and the perceptual richness of the elements that surround us give rise to a deep and detailed analysis. One of the best known sections of this school is the theory of the 5 celestial animals. It consists of five animals that are mythological with their own characteristics known as (black turtle, phoenix or red bird, green dragon, white tiger and the yellow snake) that consolidate certain appropriate configurations to structure a physical space. The form school includes the classical concepts like the Yin y Yang or the chinese 5 elements to determine and classify the environment. 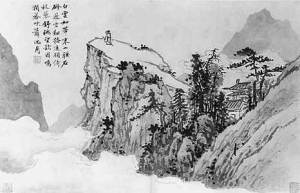 The observation of the energy currents, called water and mountain dragons, is also a very important part of study. This school makes a systematic study of the cardinal directions and the time factor, being its most popular tool the Lo Pan or traditional Chinese compass, ostentatiously more complex and detailed than the occidental compass. This school presents a large number of mathematical formulas based on the existence of numerical patterns such as the Lo Shu or magical chinese square. The most known aspects of the compass school are Ba Zhai or Pa Chai (8 houses) and Xuan Kong Fei Xing school, also known as the school of the flying stars. Masters like Joseph Yu, Eva Wong, Yap Cheng Hai, Raymond Lo, Larry Sang are some of the wordly best known disseminaters. See links. is attributed to Lin Yung, head of the Tibetan branch of the black hats (BTB). It is well known in the West, possibly because of the ease of its method and also because of the incorporation of what has been made known as the aspirations of life. It consists on associatingto the physical space 9 symbolic areas called (benefactors, career, knowledge, family, health, creativity, prosperity, fame and relationships). An important part of this method is based on intentionality This branch of feng shui is recent (70's) when we consider other schools originated in ancient Chinese dynasties. The aspiration method is sometimes criticized or pushed out of the traditional feng shui, although the latter was due in large part of its current extense divulgence. A current and well-known writer, Lillian Too has released a variant of the method that uses the front door, placing the areas in reference of the cardinal directions. Master Joseph Yu spoke in one of his articles that this method has its origins in Hong Kong about 100 years ago. is another branch under discussion that suggests adapting the order of the trigrams and orientations to the geographic field. For most teachers, the geographic differences between north and south do not change the essential use of the compass or the interpretation, although it is true that some events do manifest in different ways on and another of the globe. Nobody can ignore that the seasons have different activity and duration according to the geographical parts and that the influence of the sun and the moon is different, and so on. Feng shui, now as before, continues to show disputes and differences. This should not be an impediment to its study. A knowledge can be enriched with different points of view if there is respect and humility. Good teachers tend to keep these principles and the differences of opinion do not undermine their work and individual experience, but they tell the student that feng shui is not something rigid and unchanging and certain points of view are possible. However, considering the most important facts there uses to exist a general agreement, facts that constitute perhaps the backbone of Feng Shui. The highly harsh or destructive attitudes among some groups promote distance generating Sha Qi (sick energy). When practitioners lose a lot of time criticizing contemptuously they also lose the valuable opportunity to better know themselves and fraternize. 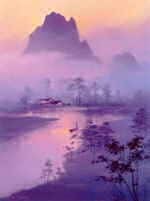 On many occasions the ego (very characteristic in students of the metaphysical science) moves away, paradoxically, the main values upheld by feng shui, the search for harmony and balanced energy, called by the Chinese teachers "Sheng Qi". To learn and practice feng shui, a part from a basis in the theoretical study of the schools, it is recommendable a good willingness of sensitivity and common sense at the same time. It is an obvious fact that some people choose favorable spots in a transparent and automatic way, even without having knowledge of feng shui. An internal disposition towards the environment and the beauty that surrounds us has a fundamental value, which must not be disdained. Perhaps, the earlier mentioned fact is easily understood by artists, architects, interior designers, engineers and other professionals who use the principles of Feng Shui naturally, although it is possible that some traditional teacher attributes this favorable election to possessing certain innate characteristics, but this would lead us to other parallel studies to Feng Shui such as Zi Wei Dou Shu or Ziping Ba Zi branch (Four Pillars of Destiny) that include the Chinese metaphysical study. If you want to go deep into feng shui, you will not be missing time for its study and research. You will see that its origin dates back thousands of years ago and becomes connected the most extensive knowledge, combining town planning, ecology, aesthetics, spirituality, prediction with profound observations of the natural environment.